In this series I devised a system whereby I could attempt to quantify emotions reported in different subject’s dreams and then create visualizations from the data I gathered. Methodologically, the project is itself a nightmare! The quantification of emotion is entirely subjective, the development of a suitably scaled register of emotions extremely tricky, the sample sizes (nine dreams per subject) are too small, and it is next to impossible to assign visibly distinct colors and patterns to a range of emotions large enough to do some justice to the complex human psyche! So as a work of legitimate “science”, these diagrams are likely of marginal value (and perhaps that is part of the point!). Still, they do present at a glance a general “gestalt” of a dreamer, and it is easier to note certain features in this format than from a chart of numbers, and possibly more extensive visualization projects would be helpful. But more importantly, here dream reports are transformed into peculiar geometries resembling crop circles, with only the subtle hints of names to indicate their manifest content. All the dreams analyzed here are taken from “The Dreambank“, a dream report repository maintained by Adam Schneider & G. William Domhoff at the Department of Psychology, UC Santa Cruz. Below is the legend used to encode (and decode) the diagrams. 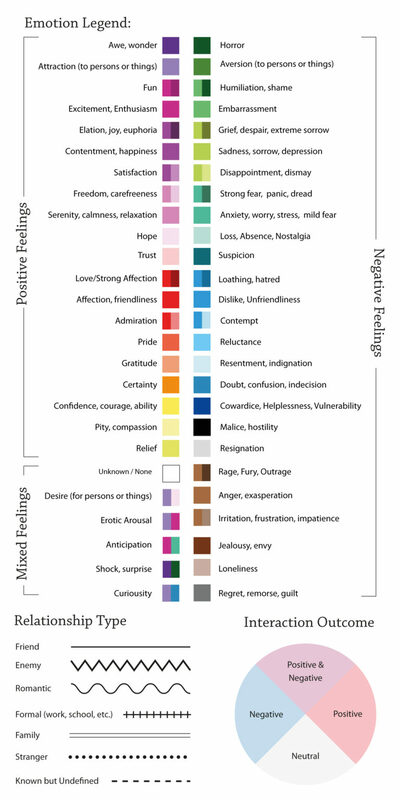 Note that “cool” colors, (greens, blues and also browns) indicate more negative feelings, while “warm” colors (reds, purples, yellows) indicate more positive feelings. Use the links below to view the dreams of the following subjects (whose names have been changed, FYI!). All the Latest on Instagram! I'm using the Cactus theme, and I like it!